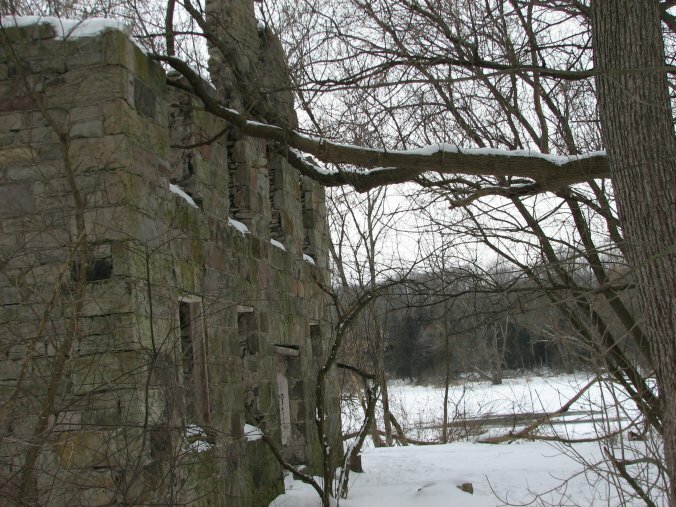 My team,Southern Ontario Paranormal Society started investigating and later researching the ruins of a mill that has come to be known as The German Mill. Built in the 1840’s as a woolen mill and then later becoming a bed and breakfast before it’s abandonment in the early 1900’s. Today, it lay in ruins, it’s sturdy shell all that remains. It’s history is vague, scattered with only small glimpses of newspaper articles. Most of it’s reported paranormal history has been passed down through myth and personal experiences. Our task has been trying to uncover any legitimate activity, if that’s possible. For the past 4 years SOPS has carried out over 6 investigations at the mill, with little documented evidence. Though, the time in location has proven that it is only a matter of time before more documented proof could be on it’s way. Many experiences have been shared by many of the team members. Everything from mysterious native drum beats off in the distance with no reserves in the area. To a mysterious white veiled woman and several feelings of a presence. Of course much of this really means nothing without documented evidence, of which we are working very hard to discover. With another investigation on the horizon, we felt it was important to share with the paranormal community our research into this very historic location. Through our media representation, SOPSTV we are currently working on the latest installment episode dealing with the mill research and investigations over the years. The episode itself should be ready for all to watch by the end of June. In the meantime here’s the last teaser trailer to enjoy!! The German Mill Episode Teaser 2 from Steve Genier on Vimeo.